More people than ever before are fleeing war, persecution, natural disaster and poverty. It’s time for the world to step up. We have decided to walk 24, 900 miles – the distance around the world – in solidarity with our sisters and brothers forced to flee. We want to send a strong message to world leaders, who, in autumn this year will agree two new compacts (or agreements) at the United Nations: one on refugees and one on migration. What are the global compacts? The global compacts are a united response to the current refugee and migration crisis. The compact on refugees will be signed in September and the compact on migration will be signed in December. These compacts are important because they set the direction on how countries will respond to migrants and refugees for years to come. They are a symbol of global political cooperation on the issue of refugees and migration. The compacts are also an opportunity for us, civil society, to hold our governments to account on what they decide on migrants and refugees. We are inspired by Pope Francis’ special concern for migrants and refugees. He has spoken of this as a "unique opportunity" for Catholics worldwide to put pressure on governments to take concrete actions for the rights of people on the move. We believe that – no matter where we come from – we are all connected as children of God. We all have hopes, fears, desires and stories to share. 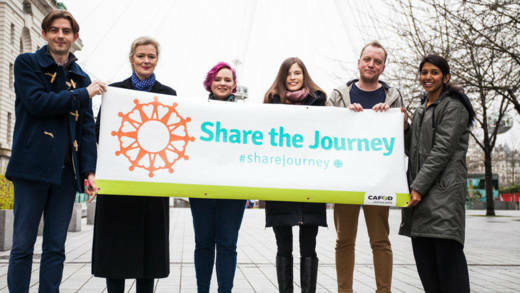 Pope Francis launched the Share the Journey campaign embracing migrants during his weekly audience in St Peter’s Square on 27 September 2017. He opened his arms in a gesture of welcome and said, "Hope is the desire to share the journey of life, as the Caritas campaign that we inaugurate today reminds us. Brothers and sisters, do not be afraid to share the journey! Do not be afraid to share hope!" We respond to this by walking 24, 900 miles - the distance around the whole world - as an act of solidarity with our brothers and sisters fleeing their homes. 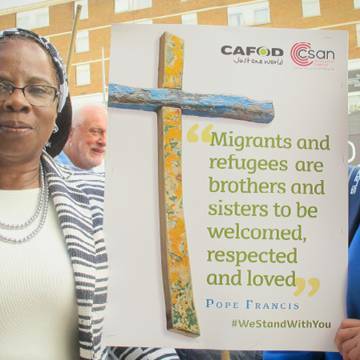 What is CAFOD calling for? We are urging the UK government to put the human dignity of migrants and refugees at the heart of the global compacts. But what do these five things actually mean? Every human is made in the image and likeness of God. We are called to treat every person with loving respect. Refugees and migrants are no different. Refugees and migrants should have the opportunity to work in host countries and to support their families. There should be quick routes to citizenship. For children especially, their nationality should be recognised by law. How is CAFOD promoting respect for human dignity in Lebanon? Our partner Mada Association in Lebanon are supporting two women's cooperatives. These are made up of Syrian refugees and Lebanese participants to improve their incomes and promote social harmony among their communities. Mada Association, with support from CAFOD, plan to hire an expert in women's co-operatives in Lebanon to support the women to improve and grow their business. There should be safe and legal routes for migrants and refugees. There should be access to education and foster care for young people separated from families. All countries should host their fair share of refugees. How is CAFOD protecting the vulnerable in Bangladesh? 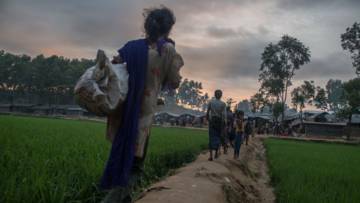 More than 600,000 people are now estimated to have fled to Bangladesh, escaping violence in Rakhine State in neighbouring Myanmar. Many refugees are sleeping in the open air and in desperate need of food and water. Others are in makeshift refugee camps along the side of the road, or wherever they can find space. CAFOD's local Church partner, Caritas Bangladesh, is responding to the refugee crisis by providing emergency aid to those in need. When a humanitarian crisis hits, most people on the move seek safety in nearby developing countries or within their own country’s borders. These ‘host countries’ should be supported. They should get full funding by the international community for development and support. How is CAFOD supporting host countries like Uganda? 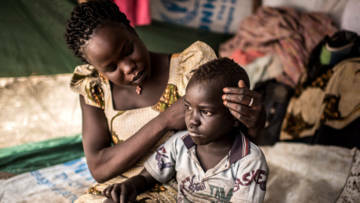 Viola Tabo from South Sudan, with her son, in their tent in Bidi Bidi settlement, Uganda. CAFOD’s local partner Caritas Uganda and other aid agencies have had to spring into action almost overnight alongside the Ugandan government to care for the needs of this sudden huge influx of people. Caritas Uganda has been providing families with knowledge, skills and farming tools so they can produce food for themselves. should be kept together or be reunited if separated. 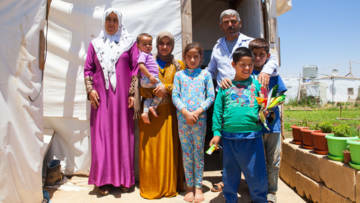 How is CAFOD keeping displaced families together? Mohammed is a Syrian refugee living in an Informal Tent Settlements (ITS) in the Bekaa Valley, Lebanon. He was photographed by Dario Mitidieri in December 2015 for Lost Family Portraits. CAFOD revisited Mohammed and his family in June 2017. Mohammed, 47, has good news about his daughter, whom he last saw on the night of her wedding in Syria. “Everywhere was being bombed. There were missiles and bombs and we just had to run,” he says. “She is in Turkey. She is trying to get her passport so she can come here.” He is eager to show photos on his phone of his daughter, 22-year-old Reem, who now has two young children with her husband. CAFOD is working with Syrian refugees in the Bekaa Valley through our local Church partner, Caritas Lebanon. Tackle the reasons why people migrate, such as conflict and climate change. Promote peaceful solutions in war-torn countries. Support people forced to flee their homes due to climate change. How is CAFOD responding to climate migration in South Asia? Devastating flooding across South Asia (such as Nepal, pictured above) is expected to get worse as the monsoon rains continue. 41 million people have been displaced and more than 1,000 have died. 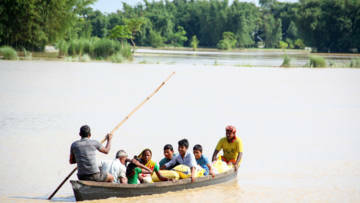 CAFOD and the Caritas network are providing emergency relief to those affected. There is special attention on preventing the spread of waterborne diseases. This is being done through the delivery of additional health, hygiene and sanitation support. We all have a stake in what is decided at the global compacts this Autumn. Pope Francis reminds us that we have a role to play in ensuring that the compacts hold human dignity at its heart. Now that you have read more about these vital decisions, why not stand up in solidarity with our brothers and sisters around the world? We're aiming to walk 24,900 miles around the world. Hold a parish walk and add your miles to the total.